Berkelium is a transuranic radioactive chemical element with symbol Bk and atomic number 97. It is a member of the actinide and transuranium element series. It is named after the city of Berkeley, California, the location of the Lawrence Berkeley National Laboratory (then the University of California Radiation Laboratory) where it was discovered in December 1949. Berkelium was the fifth transuranium element discovered after neptunium, plutonium, curium and americium. The major isotope of berkelium, 249Bk, is synthesized in minute quantities in dedicated high-flux nuclear reactors, mainly at the Oak Ridge National Laboratory in Tennessee, USA, and at the Research Institute of Atomic Reactors in Dimitrovgrad, Russia. The production of the second-most important isotope 247Bk involves the irradiation of the rare isotope 244Cm with high-energy alpha particles. Just over one gram of berkelium has been produced in the United States since 1967. There is no practical application of berkelium outside scientific research which is mostly directed at the synthesis of heavier transuranic elements and transactinides. A 22 milligram batch of berkelium-249 was prepared during a 250-day irradiation period and then purified for a further 90 days at Oak Ridge in 2009. This sample was used to synthesize the new element tennessine for the first time in 2009 at the Joint Institute for Nuclear Research, Russia, after it was bombarded with calcium-48 ions for 150 days. This was the culmination of the Russia–US collaboration on the synthesis of the heaviest elements on the periodic table. Berkelium is a soft, silvery-white, radioactive metal. The berkelium-249 isotope emits low-energy electrons and thus is relatively safe to handle. It decays with a half-life of 330 days to californium-249, which is a strong emitter of ionizing alpha particles. This gradual transformation is an important consideration when studying the properties of elemental berkelium and its chemical compounds, since the formation of californium brings not only chemical contamination, but also free-radical effects and self-heating from the emitted alpha particles. Berkelium is a soft, silvery-white, radioactive actinide metal. In the periodic table, it is located to the right of the actinide curium, to the left of the actinide californium and below the lanthanide terbium with which it shares many similarities in physical and chemical properties. Its density of 14.78 g/cm3 lies between those of curium (13.52 g/cm3) and californium (15.1 g/cm3), as does its melting point of 986 °C, below that of curium (1340 °C) but higher than that of californium (900 °C). Berkelium is relatively soft and has one of the lowest bulk moduli among the actinides, at about 20 GPa (2×1010 Pa). Berkelium(III) ions shows two sharp fluorescence peaks at 652 nanometers (red light) and 742 nanometers (deep red – near infrared) due to internal transitions at the f-electron shell. The relative intensity of these peaks depends on the excitation power and temperature of the sample. This emission can be observed, for example, after dispersing berkelium ions in a silicate glass, by melting the glass in presence of berkelium oxide or halide. Between 70 K and room temperature, berkelium behaves as a Curie–Weiss paramagnetic material with an effective magnetic moment of 9.69 Bohr magnetons (µB) and a Curie temperature of 101 K. This magnetic moment is almost equal to the theoretical value of 9.72 µB calculated within the simple atomic L-S coupling model. Upon cooling to about 34 K, berkelium undergoes a transition to an antiferromagnetic state. Enthalpy of dissolution in hydrochloric acid at standard conditions is −600 kJ/mol, from which the standard enthalpy change of formation (ΔfH°) of aqueous Bk3+ ions is obtained as −601 kJ/mol. The standard potential Bk3+/Bk0 is −2.01 V. The ionization potential of a neutral berkelium atom is 6.23 eV. At ambient conditions, berkelium assumes its most stable α form which has a hexagonal symmetry, space group P63/mmc, lattice parameters of 341 pm and 1107 pm. The crystal has a double-hexagonal close packing structure with the layer sequence ABAC and so is isotypic (having a similar structure) with α-lanthanum and α-forms of actinides beyond curium. This crystal structure changes with pressure and temperature. When compressed at room temperature to 7 GPa, α-berkelium transforms to the beta modification, which has a face-centered cubic (fcc) symmetry and space group Fm3m. This transition occurs without change in volume, but the enthalpy increases by 3.66 kJ/mol. Upon further compression to 25 GPa, berkelium transforms to an orthorhombic γ-berkelium structure similar to that of α-uranium. This transition is accompanied by a 12% volume decrease and delocalization of the electrons at the 5f electron shell. No further phase transitions are observed up to 57 GPa. Upon heating, α-berkelium transforms into another phase with an fcc lattice (but slightly different from β-berkelium), space group Fm3m and the lattice constant of 500 pm; this fcc structure is equivalent to the closest packing with the sequence ABC. This phase is metastable and will gradually revert to the original α-berkelium phase at room temperature. The temperature of the phase transition is believed to be quite close to the melting point. Like all actinides, berkelium dissolves in various aqueous inorganic acids, liberating gaseous hydrogen and converting into the berkelium(III) state. This trivalent oxidation state (+3) is the most stable, especially in aqueous solutions, but tetravalent (+4) and possibly divalent (+2) berkelium compounds are also known. The existence of divalent berkelium salts is uncertain and has only been reported in mixed lanthanum chloride-strontium chloride melts. A similar behavior is observed for the lanthanide analogue of berkelium, terbium. Aqueous solutions of Bk3+ ions are green in most acids. The color of Bk4+ ions is yellow in hydrochloric acid and orange-yellow in sulfuric acid. Berkelium does not react rapidly with oxygen at room temperature, possibly due to the formation of a protective oxide layer surface. However, it reacts with molten metals, hydrogen, halogens, chalcogens and pnictogens to form various binary compounds. About twenty isotopes and six nuclear isomers (excited states of an isotope) of berkelium have been characterized with the mass numbers ranging from 235 to 254. All of them are radioactive. The longest half-lives are observed for 247Bk (1,380 years), 248Bk (over 300 years) and 249Bk (330 days); the half-lives of the other isotopes range from microseconds to several days. The isotope which is the easiest to synthesize is berkelium-249. This emits mostly soft β-particles which are inconvenient for detection. Its alpha radiation is rather weak – 1.45×10−3% with respect to the β-radiation – but is sometimes used to detect this isotope. The second important berkelium isotope, berkelium-247, is an alpha-emitter, as are most actinide isotopes. All berkelium isotopes have a half-life far too short to be primordial. Therefore, any primordial berkelium, that is, berkelium present on the Earth during its formation, has decayed by now. On Earth, berkelium is mostly concentrated in certain areas, which were used for the atmospheric nuclear weapons tests between 1945 and 1980, as well as at the sites of nuclear incidents, such as the Chernobyl disaster, Three Mile Island accident and 1968 Thule Air Base B-52 crash. Analysis of the debris at the testing site of the first U.S. hydrogen bomb, Ivy Mike, (1 November 1952, Enewetak Atoll), revealed high concentrations of various actinides, including berkelium. For reasons of military secrecy, this result was published only in 1956. Nuclear reactors produce mostly, among the berkelium isotopes, berkelium-249. During the storage and before the fuel disposal, most of it beta decays to californium-249. The latter has a half-life of 351 years, which is relatively long when compared to the other isotopes produced in the reactor, and is therefore undesirable in the disposal products. The transuranic elements from americium to fermium, including berkelium, occurred naturally in the natural nuclear fission reactor at Oklo, but no longer do so. Although very small amounts of berkelium were possibly produced in previous nuclear experiments, it was first intentionally synthesized, isolated and identified in December 1949 by Glenn T. Seaborg, Albert Ghiorso, Stanley G. Thompson, and Kenneth Street, Jr.. They used the 60-inch cyclotron at the University of California, Berkeley. Similar to the nearly simultaneous discovery of americium (element 95) and curium (element 96) in 1944, the new elements berkelium and californium (element 98) were both produced in 1949–1950. The name choice for element 97 followed the previous tradition of the Californian group to draw an analogy between the newly discovered actinide and the lanthanide element positioned above it in the periodic table. Previously, americium was named after a continent as its analogue europium, and curium honored scientists Marie and Pierre Curie as the lanthanide above it, gadolinium, was named after the explorer of the rare earth elements Johan Gadolin. Thus the discovery report by the Berkeley group reads: "It is suggested that element 97 be given the name berkelium (symbol Bk) after the city of Berkeley in a manner similar to that used in naming its chemical homologue terbium (atomic number 65) whose name was derived from the town of Ytterby, Sweden, where the rare earth minerals were first found." This tradition ended on berkelium, though, as the naming of the next discovered actinide, californium, was not related to its lanthanide analogue dysprosium, but after the discovery place. 3). This step yielded a mixture of the accompanying product curium and the expected element 97 in form of trifluorides. The mixture was converted to the corresponding hydroxides by treating it with potassium hydroxide, and after centrifugation, was dissolved in perchloric acid. Further separation was carried out in the presence of a citric acid/ammonium buffer solution in a weakly acidic medium (pH≈3.5), using ion exchange at elevated temperature. The chromatographic separation behavior was unknown for the element 97 at the time, but was anticipated by analogy with terbium. The first results were disappointing because no alpha-particle emission signature could be detected from the elution product. With further analysis, searching for characteristic X-rays and conversion electron signals, a berkelium isotope was eventually detected. Its mass number was uncertain between 243 and 244 in the initial report, but was later established as 243. Although 247Bk is the most stable isotope of berkelium, its production in nuclear reactors is very difficut because its potential progenitor 247Cm has never been observed to undergo beta decay. Thus, 249Bk is the most accessible isotope of berkelium, which still is available only in small quantities (only 0.66 grams have been produced in the US over the period 1967–1983) at a high price of the order 185 USD per microgram. It is the only berkelium isotope available in bulk quantities, and thus the only berkelium isotope whose properties can be extensively studied. Berkelium-242 was synthesized in 1979 by bombarding 235U with 11B, 238U with 10B, 232Th with 14N or 232Th with 15N. It converts by electron capture to 242Cm with a half-life of 7000700000000000000♠7.0±1.3 minutes. A search for an initially suspected isotope 241Bk was then unsuccessful; 241Bk has since been synthesized. 3), or photochemical oxidation procedures. More recently, it has been discovered that some organic and bio-inspired molecules, such as the chelator called 3,4,3-LI(1,2-HOPO), can also oxidize Bk(III) and stabilize Bk(IV) under mild conditions. Berkelium(IV) is then extracted with ion exchange, extraction chromatography or liquid-liquid extraction using HDEHP (bis-(2-ethylhexyl) phosphoric acid), amines, tributyl phosphate or various other reagents. These procedures separate berkelium from most trivalent actinides and lanthanides, except for the lanthanide cerium (lanthanides are absent in the irradiation target but are created in various nuclear fission decay chains). A more detailed procedure adopted at the Oak Ridge National Laboratory was as follows: the initial mixture of actinides is processed with ion exchange using lithium chloride reagent, then precipitated as hydroxides, filtered and dissolved in nitric acid. It is then treated with high-pressure elution from cation exchange resins, and the berkelium phase is oxidized and extracted using one of the procedures described above. Reduction of the thus-obtained berkelium(IV) to the +3 oxidation state yields a solution, which is nearly free from other actinides (but contains cerium). Berkelium and cerium are then separated with another round of ion-exchange treatment. In order to characterize chemical and physical properties of solid berkelium and its compounds, a program was initiated in 1952 at the Material Testing Reactor, Arco, Idaho, US. It resulted in preparation of an eight-gram plutonium-239 target and in the first production of macroscopic quantities (0.6 micrograms) of berkelium by Burris B. Cunningham and Stanley G. Thompson in 1958, after a continuous reactor irradiation of this target for six years. This irradiation method was and still is the only way of producing weighable amounts of the element, and most solid-state studies of berkelium have been conducted on microgram or submicrogram-sized samples. The world's major irradiation sources are the 85-megawatt High Flux Isotope Reactor at the Oak Ridge National Laboratory in Tennessee, USA, and the SM-2 loop reactor at the Research Institute of Atomic Reactors (NIIAR) in Dimitrovgrad, Russia, which are both dedicated to the production of transcurium elements (atomic number greater than 96). These facilities have similar power and flux levels, and are expected to have comparable production capacities for transcurium elements, although the quantities produced at NIIAR are not publicly reported. In a "typical processing campaign" at Oak Ridge, tens of grams of curium are irradiated to produce decigram quantities of californium, milligram quantities of berkelium-249 and einsteinium, and picogram quantities of fermium. In total, just over one gram of berkelium-249 has been produced at Oak Ridge since 1967. The first berkelium metal sample weighing 1.7 micrograms was prepared in 1971 by the reduction of berkelium(III) fluoride with lithium vapor at 1000 °C; the fluoride was suspended on a tungsten wire above a tantalum crucible containing molten lithium. Later, metal samples weighing up to 0.5 milligrams were obtained with this method. Similar results are obtained with berkelium(IV) fluoride. Berkelium metal can also be produced by the reduction of berkelium(IV) oxide with thorium or lanthanum. Upon heating to 1200 °C, the oxide Bk2O3 undergoes a phase change; it undergoes another phase change at 1750 °C. Such three-phase behavior is typical for the actinide sesquioxides. Berkelium(II) oxide, BkO, has been reported as a brittle gray solid but its exact chemical composition remains uncertain. In halides, berkelium assumes the oxidation states +3 and +4. The +3 state is the most stable, especially in solutions, while the tetravalent halides BkF4 and Cs2BkCl6 are only known in the solid phase. The coordination of berkelium atom in its trivalent fluoride and chloride is tricapped trigonal prismatic, with the coordination number of 9. In trivalent bromide, it is bicapped trigonal prismatic (coordination 8) or octahedral (coordination 6), and in the iodide it is octahedral. Berkelium(IV) fluoride (BkF4) is a yellow-green ionic solid and is isotypic with uranium tetrafluoride or zirconium(IV) fluoride. Berkelium(III) fluoride (BkF3) is also a yellow-green solid, but it has two crystalline structures. The most stable phase at low temperatures is isotypic with yttrium(III) fluoride, while upon heating to between 350 and 600 °C, it transforms to the structure found in lanthanum(III) fluoride. Visible amounts of berkelium(III) chloride (BkCl3) were first isolated and characterized in 1962, and weighed only 3 billionths of a gram. It can be prepared by introducing hydrogen chloride vapors into an evacuated quartz tube containing berkelium oxide at a temperature about 500 °C. This green solid has a melting point of 600 °C, and is isotypic with uranium(III) chloride. Upon heating to nearly melting point, BkCl3 converts into an orthorhombic phase. Two forms of berkelium(III) bromide are known: one with berkelium having coordination 6, and one with coordination 8. The latter is less stable and transforms to the former phase upon heating to about 350 °C. An important phenomenon for radioactive solids has been studied on these two crystal forms: the structure of fresh and aged 249BkBr3 samples was probed by X-ray diffraction over a period longer than 3 years, so that various fractions of berkelium-249 had beta decayed to californium-249. No change in structure was observed upon the 249BkBr3—249CfBr3 transformation. However, other differences were noted for 249BkBr3 and 249CfBr3. For example, the latter could be reduced with hydrogen to 249CfBr2, but the former could not – this result was reproduced on individual 249BkBr3 and 249CfBr3 samples, as well on the samples containing both bromides. The intergrowth of californium in berkelium occurs at a rate of 0.22% per day and is an intrinsic obstacle in studying berkelium properties. Beside a chemical contamination, 249Cf, being an alpha emitter, brings undesirable self-damage of the crystal lattice and the resulting self-heating. The chemical effect however can be avoided by performing measurements as a function of time and extrapolating the obtained results. The pnictides of berkelium-249 of the type BkX are known for the elements nitrogen, phosphorus, arsenic and antimony. They crystallize in the rock-salt structure and are prepared by the reaction of either berkelium(III) hydride (BkH3) or metallic berkelium with these elements at elevated temperature (about 600 °C) under high vacuum. Berkelium(III) sulfide, Bk2S3, is prepared by either treating berkelium oxide with a mixture of hydrogen sulfide and carbon disulfide vapors at 1130 °C, or by directly reacting metallic berkelium with elemental sulfur. These procedures yield brownish-black crystals. 4). This compound is thermally stable to at least 1000 °C in inert atmosphere. Berkelium forms a trigonal (η5–C5H5)3Bk metallocene complex with three cyclopentadienyl rings, which can be synthesized by reacting berkelium(III) chloride with the molten beryllocene (Be(C5H5)2) at about 70 °C. It has an amber color and a density of 2.47 g/cm3. The complex is stable to heating to at least 250 °C, and sublimates without melting at about 350 °C. The high radioactivity of berkelium gradually destroys the compound (within a period of weeks). One cyclopentadienyl ring in (η5–C5H5)3Bk can be substituted by chlorine to yield [Bk(C5H5)2Cl]2. The optical absorption spectra of this compound are very similar to those of (η5–C5H5)3Bk. There is currently no use for any isotope of berkelium outside basic scientific research. Berkelium-249 is a common target nuclide to prepare still heavier transuranic elements and transactinides, such as lawrencium, rutherfordium and bohrium. It is also useful as a source of the isotope californium-249, which is used for studies on the chemistry of californium in preference to the more radioactive californium-252 that is produced in neutron bombardment facilities such as the HFIR. A 22 milligram batch of berkelium-249 was prepared in a 250-day irradiation and then purified for 90 days at Oak Ridge in 2009. This target yielded the first 6 atoms of tennessine at the Joint Institute for Nuclear Research (JINR), Dubna, Russia, after bombarding it with calcium ions in the U400 cyclotron for 150 days. This synthesis was a culmination of the Russia—US collaboration between JINR and Lawrence Livermore National Laboratory on the synthesis of elements 113 to 118 which was initiated in 1989. The nuclear fission properties of berkelium are different from those of the neighboring actinides curium and californium, and they suggest berkelium to perform poorly as a fuel in a nuclear reactor. Specifically, berkelium-249 has a moderately large neutron capture cross section of 710 barns for thermal neutrons, 1200 barns resonance integral, but very low fission cross section for thermal neutrons. In a thermal reactor, much of it will therefore be converted to berkelium-250 which quickly decays to californium-250. In principle, berkelium-249 can sustain a nuclear chain reaction in a fast breeder reactor. Its critical mass is relatively high at 192 kg; it can be reduced with a water or steel reflector but would still exceed the world production of this isotope. Berkelium-247 can maintain chain reaction both in a thermal-neutron and in a fast-neutron reactor, however, its production is rather complex and thus the availability is much lower than its critical mass, which is about 75.7 kg for a bare sphere, 41.2 kg with a water reflector and 35.2 kg with a steel reflector (30 cm thickness). Little is known about the effects of berkelium on human body, and analogies with other elements may not be drawn because of different radiation products (electrons for berkelium and alpha particles, neutrons, or both for most other actinides). The low energy of electrons emitted from berkelium-249 (less than 126 keV) hinders its detection, due to signal interference with other decay processes, but also makes this isotope relatively harmless to humans as compared to other actinides. However, berkelium-249 transforms with a half-life of only 330 days to the strong alpha-emitter californium-249, which is rather dangerous and has to be handled in a glove box in a dedicated laboratory. Most available berkelium toxicity data originate from research on animals. Upon ingestion by rats, only about 0.01% berkelium ends in the blood stream. From there, about 65% goes to the bones, where it remains for about 50 years, 25% to the lungs (biological half-life about 20 years), 0.035% to the testicles or 0.01% to the ovaries where berkelium stays indefinitely. The balance of about 10% is excreted. In all these organs berkelium might promote cancer, and in the skeletal system its radiation can damage red blood cells. The maximum permissible amount of berkelium-249 in the human skeleton is 0.4 nanograms. ^ Kovács, Attila; Dau, Phuong D.; Marçalo, Joaquim; Gibson, John K. (2018). "Pentavalent Curium, Berkelium, and Californium in Nitrate Complexes: Extending Actinide Chemistry and Oxidation States". Inorg. Chem. American Chemical Society. 57 (15): 9453–9467. doi:10.1021/acs.inorgchem.8b01450. ^ a b Benedict, U. (1984). "Study of actinide metals and actinide compounds under high pressures". Journal of the Less Common Metals. 100: 153–170. doi:10.1016/0022-5088(84)90061-4. ^ Assefa, Z.; Haire, R. G.; Stump, N. A. (1998). "Emission profile of Bk(III) in a silicate matrix: anomalous dependence on excitation power". Journal of Alloys and Compounds. 271-273: 854–858. doi:10.1016/S0925-8388(98)00233-3. ^ a b Peterson 1984, p. 45. ^ Fuger, J.; Haire, R. G.; Peterson, J. R. (1981). "A new determination of the enthalpy of solution of berkelium metal and the standard enthalpy of formation of Bk3+ (aq)". Journal of Inorganic and Nuclear Chemistry. 43 (12): 3209. doi:10.1016/0022-1902(81)80090-5. ^ Peterson 1984, p. 34. ^ a b c Peterson, J. R.; Fahey, J. A.; Baybarz, R. D. (1971). "The crystal structures and lattice parameters of berkelium metal". J. Inorg. Nucl. Chem. 33 (10): 3345–51. doi:10.1016/0022-1902(71)80656-5. ^ Peterson 1984, p. 44. ^ a b Itie, J. P.; Peterson, J. R.; Haire, R. G.; Dufour, C.; Benedict, U. (1985). "Delocalisation of 5f electrons in berkelium-californium alloys under pressure". Journal of Physics F: Metal Physics. 15 (9): L213. Bibcode:1985JPhF...15L.213I. doi:10.1088/0305-4608/15/9/001. ^ a b c d e f g Hobart, David E.; Peterson, Joseph R. (2006). "Berkelium". In Morss, Lester R.; Edelstein, Norman M.; Fuger, Jean. The Chemistry of the Actinide and Transactinide Elements (PDF). 3 (3rd ed.). Dordrecht, the Netherlands: Springer. pp. 1444–98. doi:10.1007/1-4020-3598-5_10. ISBN 978-1-4020-3555-5. ^ Fahey, J. A.; Peterson, J. R.; Baybarz, R. D. (1972). "Some properties of berkelium metal and the apparent trend toward divalent character in the transcurium actinide metals". Inorg. Nucl. Chem. Lett. 8 (1): 101–7. doi:10.1016/0020-1650(72)80092-8. ^ Ward, John W.; Kleinschmidt, Phillip D.; Haire, Richard G. (1982). "Vapor pressure and thermodynamics of Bk-249 metal". J. Chem. Phys. 77 (3): 1464–68. Bibcode:1982JChPh..77.1464W. doi:10.1063/1.443975. ^ Deblonde, Gauthier J.-P.; Kelley, Morgan P.; Su, Jing; Batista, Enrique R.; Yang, Ping; Booth, Corwin H.; Abergel, Rebecca J. (2018). "Spectroscopic and Computational Characterization of Diethylenetriaminepentaacetic Acid/Transplutonium Chelates: Evidencing Heterogeneity in the Heavy Actinide(III) Series". Angewandte Chemie International Edition. 57 (17): 4521–4526. doi:10.1002/anie.201709183. ISSN 1521-3773. PMID 29473263. ^ Kelley, Morgan P.; Deblonde, Gauthier J.-P.; Su, Jing; Booth, Corwin H.; Abergel, Rebecca J.; Batista, Enrique R.; Yang, Ping (2018-05-07). "Bond Covalency and Oxidation State of Actinide Ions Complexed with Therapeutic Chelating Agent 3,4,3-LI(1,2-HOPO)". Inorganic Chemistry. 57 (9): 5352–5363. doi:10.1021/acs.inorgchem.8b00345. ISSN 0020-1669. PMID 29624372. ^ a b Deblonde, Gauthier; Sturzbecher-Hoehne, Manuel; Rupert, Peter; An, Dahlia; Illy, Marie-Claire; Ralston, Corie; brabec, Jiri; de Jong, Wibe; Strong, Roland; Abergel, Rebecca (2017). "Chelation and stabilization of berkelium in oxidation state +IV". Nature Chemistry. 9 (9): 843–849. Bibcode:2017NatCh...9..843D. doi:10.1038/nchem.2759. PMID 28837177. ^ a b Peterson 1984, p. 55. ^ Sullivan, Jim C.; Schmidt, K. H.; Morss, L. R.; Pippin, C. G.; Williams, C. (1988). "Pulse radiolysis studies of berkelium(III): preparation and identification of berkelium(II) in aqueous perchlorate media". Inorganic Chemistry. 27 (4): 597. doi:10.1021/ic00277a005. ^ a b c Thompson, Stanley G.; Seaborg, Glenn T. (1950). "Chemical Properties of Berkelium". doi:10.2172/932812. Archived from the original on 18 August 2011. ^ Holleman 2007, p. 1956. ^ Greenwood 1997, p. 1265. ^ B. Myasoedov; et al. (1972). Analytical chemistry of transplutonium elements. Moscow: Nauka. ISBN 978-0-470-62715-0. ^ a b Audi, Georges; Bersillon, Olivier; Blachot, Jean; Wapstra, Aaldert Hendrik (1997). "The NUBASE evaluation of nuclear and decay properties" (PDF). Nuclear Physics A. 624 (1): 1–124. Bibcode:1997NuPhA.624....1A. doi:10.1016/S0375-9474(97)00482-X. Archived from the original (PDF) on 2008-09-23. ^ NNDC contributors (2008). Alejandro A. Sonzogni (Database Manager), ed. "Chart of Nuclides". Upton, New York: National Nuclear Data Center, Brookhaven National Laboratory. Retrieved 2010-03-01. ^ Thompson, S.; Ghiorso, A.; Seaborg, G. (1950). "Element 97". Physical Review. 77 (6): 838. Bibcode:1950PhRv...77..838T. doi:10.1103/PhysRev.77.838.2. ^ Thompson, S. G.; Cunningham, B. 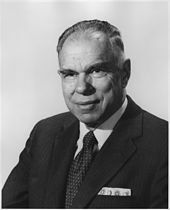 B.; Seaborg, G. T. (1950). "Chemical Properties of Berkelium". Journal of the American Chemical Society. 72 (6): 2798. doi:10.1021/ja01162a538. ^ "Comment". The New Yorker. Retrieved 4 June 2017. ^ Heiserman, David L. (1992). "Element 98: Californium". Exploring Chemical Elements and their Compounds. TAB Books. p. 347. ISBN 978-0-8306-3018-9. ^ Thompson, S.; Ghiorso, A.; Harvey, B.; Choppin, G. (1954). "Transcurium Isotopes Produced in the Neutron Irradiation of Plutonium". Physical Review. 93 (4): 908. Bibcode:1954PhRv...93..908T. doi:10.1103/PhysRev.93.908. ^ Magnusson, L.; Studier, M.; Fields, P.; Stevens, C.; Mech, J.; Friedman, A.; Diamond, H.; Huizenga, J. (1954). "Berkelium and Californium Isotopes Produced in Neutron Irradiation of Plutonium". Physical Review. 96 (6): 1576. Bibcode:1954PhRv...96.1576M. doi:10.1103/PhysRev.96.1576. ^ Eastwood, T.; Butler, J.; Cabell, M.; Jackson, H.; Schuman, R.; Rourke, F.; Collins, T. (1957). "Isotopes of Berkelium and Californium Produced by Neutron Irradiation of Plutonium". Physical Review. 107 (6): 1635. Bibcode:1957PhRv..107.1635E. doi:10.1103/PhysRev.107.1635. ^ a b Peterson 1984, p. 30. ^ Trabesinger, A. (2017). "Peaceful berkelium". Nature Chemistry. 9: 924. ^ Hulet, E. (1956). "New Isotope of Berkelium". Physical Review. 102 (1): 182. Bibcode:1956PhRv..102..182H. doi:10.1103/PhysRev.102.182. ^ Williams, Kimberly; Seaborg, Glenn (1979). "New isotope 242Bk". Physical Review C. 19 (5): 1794. Bibcode:1979PhRvC..19.1794W. doi:10.1103/PhysRevC.19.1794. ^ Nucleonica (2007–2011). "Nucleonica: Universal Nuclide Chart". Nucleonica. Retrieved July 22, 2011. ^ a b Peterson 1984, p. 32. ^ Peterson 1984, pp. 33–34. ^ a b Peterson 1984, p. 38. ^ "Радионуклидные источники и препараты". Research Institute of Atomic Reactors. Retrieved 2010-09-26. ^ Haire, Richard G. (2006). "Einsteinium". In Morss, Lester R.; Edelstein, Norman M.; Fuger, Jean. The Chemistry of the Actinide and Transactinide Elements (PDF). 3 (3rd ed.). Dordrecht, the Netherlands: Springer. pp. 1577–1620. doi:10.1007/1-4020-3598-5_12. ISBN 978-1-4020-3555-5. Archived from the original (PDF) on 17 July 2010. ^ Greenwood 1997, p. 1262. ^ Porter, C. E.; Riley, F. D., Jr.; Vandergrift, R. D.; Felker, L. K. (1997). "Fermium Purification Using Teva Resin Extraction Chromatography". Sep. Sci. Technol. 32 (1–4): 83–92. doi:10.1080/01496399708003188. ^ a b c Peterson 1984, p. 41. ^ Spirlet, J. C.; Peterson, J. R.; Asprey, L. B. (1987). Preparation and Purification of Actinide Metals. Adv. Inorg. Chem. Advances in Inorganic Chemistry. 31. pp. 1–41. doi:10.1016/S0898-8838(08)60220-2. ISBN 9780120236312. ^ Peterson, J.; Cunningham, B. B. (1967). "Crystal structures and lattice parameters of the compounds of berkelium I. Berkelium dioxide and cubic berkelium sesquioxide". Inorganic and Nuclear Chemistry Letters. 3 (9): 327. doi:10.1016/0020-1650(67)80037-0. ^ a b Baybarz, R. D. (1968). "The berkelium oxide system". Journal of Inorganic and Nuclear Chemistry. 30 (7): 1769–1773. doi:10.1016/0022-1902(68)80352-5. ^ Holleman 2007, p. 1972. ^ a b Peterson 1984, p. 51. ^ a b Holleman 2007, p. 1969. ^ a b c Peterson 1984, p. 47. ^ a b c Young, J. P.; Haire, R. G.; Peterson, J. R.; Ensor, D. D.; Fellows, R. L. (1980). "Chemical consequences of radioactive decay. 1. Study of californium-249 ingrowth into crystalline berkelium-249 tribromide: a new crystalline phase of californium tribromide". Inorganic Chemistry. 19 (8): 2209. doi:10.1021/ic50210a003. ^ a b c d e f Greenwood 1997, p. 1270. ^ a b c Peterson 1984, p. 48. ^ Burns, J.; Peterson, J. R.; Stevenson, J. N. (1975). "Crystallographic studies of some transuranic trihalides: 239PuCl3, 244CmBr3, 249BkBr3 and 249CfBr3". Journal of Inorganic and Nuclear Chemistry. 37 (3): 743. doi:10.1016/0022-1902(75)80532-X. ^ a b Ensor, D.; Peterson, J. R.; Haire, R. G.; Young, J. P. (1981). "Absorption spectrophotometric study of berkelium(III) and (IV) fluorides in the solid state". Journal of Inorganic and Nuclear Chemistry. 43 (5): 1001. doi:10.1016/0022-1902(81)80164-9. ^ Keenan, Thomas K.; Asprey, Larned B. (1969). "Lattice constants of actinide tetrafluorides including berkelium". Inorganic Chemistry. 8 (2): 235. doi:10.1021/ic50072a011. ^ Peterson, J. R.; Cunningham, B. B. (1968). "Crystal structures and lattice parameters of the compounds of berkelium—IV berkelium trifluoride☆". Journal of Inorganic and Nuclear Chemistry. 30 (7): 1775. doi:10.1016/0022-1902(68)80353-7. ^ a b Laubereau, Peter G.; Burns, John H. (1970). "Microchemical preparation of tricyclopentadienyl compounds of berkelium, californium, and some lanthanide elements". Inorganic Chemistry. 9 (5): 1091. doi:10.1021/ic50087a018. ^ Peterson, J. R.; Cunningham, B. B. (1968). "Crystal structures and lattice parameters of the compounds of berkelium—IIBerkelium trichloride". Journal of Inorganic and Nuclear Chemistry. 30 (3): 823. doi:10.1016/0022-1902(68)80443-9. ^ Peterson, J. R.; Young, J. P.; Ensor, D. D.; Haire, R. G. (1986). "Absorption spectrophotometric and x-ray diffraction studies of the trichlorides of berkelium-249 and californium-249". Inorganic Chemistry. 25 (21): 3779. doi:10.1021/ic00241a015. ^ Peterson 1984, p. 52. ^ a b Stevenson, J.; Peterson, J. (1979). "Preparation and structural studies of elemental curium-248 and the nitrides of curium-248 and berkelium-249". Journal of the Less Common Metals. 66 (2): 201. doi:10.1016/0022-5088(79)90229-7. ^ Damien, D.; Haire, R. G.; Peterson, J. R. (1980). "Preparation and lattice parameters of 249Bk monopnictides". Journal of Inorganic and Nuclear Chemistry. 42 (7): 995. doi:10.1016/0022-1902(80)80390-3. ^ a b Peterson 1984, p. 53. ^ Peterson 1984, pp. 39–40. ^ a b Peterson 1984, p. 54. ^ Haire, Richard G. (2006). "Californium". In Morss, Lester R.; Edelstein, Norman M.; Fuger, Jean. The Chemistry of the Actinide and Transactinide Elements (PDF). 3 (3rd ed.). Dordrecht, the Netherlands: Springer. pp. 1499–1576. doi:10.1007/1-4020-3598-5_11. ISBN 978-1-4020-3555-5. Archived from the original (PDF) on 17 July 2010. ^ Chadwick, M. B.; Obložinský, P.; Herman, M.; et al. (2006). "ENDF/B-VII.0: Next Generation Evaluated Nuclear Data Library for Nuclear Science and Technology". Nuclear Data Sheets. 107 (12): 2931–3060. Bibcode:2006NDS...107.2931C. doi:10.1016/j.nds.2006.11.001. ^ Koning, A. J.; Avrigeanu, M.; Avrigeanu, V.; et al. (2007). "The JEFF evaluated nuclear data project". International Conference on Nuclear Data for Science and Technology. ND2007 (194). doi:10.1051/ndata:07476. Greenwood, Norman N.; Earnshaw, Alan (1997). Chemistry of the Elements (2nd ed.). Oxford: Butterworth-Heinemann. ISBN 978-0-08-037941-8. Holleman, Arnold F.; Wiberg, Nils (2007). Textbook of Inorganic Chemistry (102nd ed.). Berlin: de Gruyter. ISBN 978-3-11-017770-1. Peterson, J. R.; Hobart, D. E. (1984). "The Chemistry of Berkelium". In Emeléus, Harry Julius. Advances in inorganic chemistry and radiochemistry. 28. Academic Press. pp. 29–64. doi:10.1016/S0898-8838(08)60204-4. ISBN 978-0-12-023628-2. Wikimedia Commons has media related to Berkelium.